There have been moments lately when I’ve found myself feeling discouraged. Discouraged by the dire circumstances many of my patients are in. Discouraged by my own shortcomings as a human being and my failure to achieve a personal goal. Most acutely this past week, I felt discouraged by divisions within communities of faith. The particulars aren’t important, but I became so sad considering how humanity will always be divided by differences of opinions. It pained me to think about the anger, strife, and disappointment that surrounds these fissures, however large or small. And as I sat there feeling more and more hopeless, it hit me like a cool ocean wave on a hot summer day: God is bigger than all of this. God is bigger than the petty things that members of faith communities squabble about. Bigger than my own failures. Bigger than the most dire of circumstances, from famine to mass genocide to horrible natural disasters. My heart felt suddenly lighter. And dare I say….joyful? It’s not up to me to figure it all out. 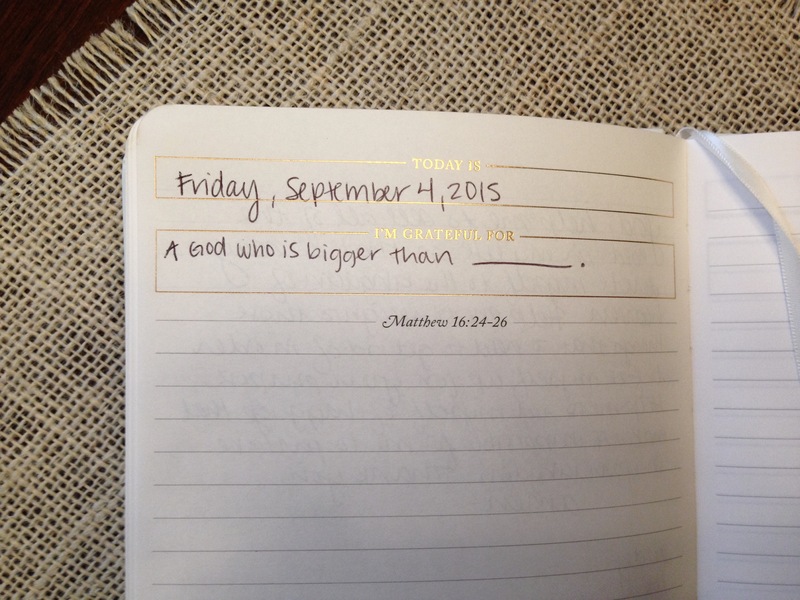 God is bigger than _____________. And let your heart be light and filled with joy. P.S (cause y’all know I love a good P.S.) – the journal pictured in the photo is the Write the Word Journal by Lara Casey. I adore it and highly recommend! I believe Volume 1 is sold out, but I am hopeful that Volume 2 will be out soon.